First Sentence: The post office box was eighteen across, twelve down, and it had a loop of wool wound around the door so Dr. Buagaew wouldn’t miss it. 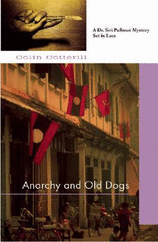 Anarchy and Old Dogs is the fourth book in Colin Cotterill's Dr. Siri Paiboun mystery series. Siri is the national coroner of Laos, albeit reluctantly. At 73 years of age, he wants nothing more than to retire and live out the rest of his years in peace. That does not prevent him from taking his job very seriously nor following the leads to wherever they may lead. When the body of a blind man is brought to the morgue after being hit by a runaway truck, Siri and his team set out to identify the unfortunate man. They discover what appears to be a blank note in his pocket, only to learn the message is written in invisible ink. To complicate matters, the letter is in code. Joined by Phosy of the local police, Siri sets out to the town believed to be the blind man's residence. They learn the man was a dentist and are directed to his wife, who explains her deceased husband liked to play chess through the mail, suggesting the code might be chess moves. It all sounds very logical on the surface, but Siri isn't willing to let it die there. Is it really as simple as it sounds or could there be something more worrisome afoot? Set in the mid-1970's, author Colin Cotterill's novel captures Laos in an interesting part of the country's history. The new government, the Lao Democratic Republic has only been in place for 18 months. The Soviet and Vietnamese influence is strong. There is much political turmoil in the country. In his younger years Siri had been among those who sought the change in government, fought alongside the resistance in favor of a more socialist and fair government. A youth's idealism had been dashed many times over as reality set in. The situation in Laos continued to be fraught with tension and strife. The author adeptly offers the reader a feel and taste for the environment in Laos during that time period as well as takes the reader into the heart and mind of the people. Dr. Siri Paiboun proves to be an interesting character. Charming and funny, he is both old fashioned and forward thinking. Despite his age and desire for a quiet life, Siri has a spirit about him that is contagious. Although not explored fully in this particular novel, most likely an ongoing feature in the series, there is thread of mysticism that runs throughout the novel. Siri hosts the spirit of a Shaman, which sometimes allows him to communicate with the dead. It fits nicely into the story and does not come across as over the top at any time. If anything, it offers a good balance between the doctor's strong scientific preference and his spiritual side. The other characters in the novel are well crafted and just as intriguing. It is clear that they are devoted to Siri and in doing what they believe is right. The story itself took a convoluted route to reach the end. It seemed to meander a bit, but as a first time reader of the series, it provided me with the opportunity to get to know the characters and a bit of their history, particularly that of Daeng, Civilai and Siri, all old friends whose idealism and political leanings had helped bring them together all those years ago. Colin Cotterill weaves a complex tale of political intrigue, friendship, dreams, and disappointments. I look forward to reading more this author in the future. Originally published on Curled Up With A Good Book at www.curledup.com. © Wendy Runyon, 2008. I highly recommend you stop by Colin Cotterill's website for a visit. It's a neat site. I love crime fiction. Thanks for the review. I like mysteries set in other countries and don't believe I've ever read one set in Laos. This sounds like an excellent series; I'm adding it to my list! Hey, this looks good! Thanks for the fab review and cranium's up. Jenclair - This was a first for me too. I'm having fun exploring all these new places through crime fiction. 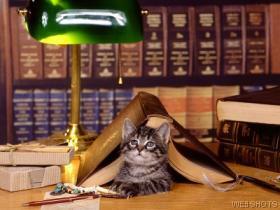 Vickie - I'm looking forward to reading the earlier books in the series. I really got attached to the characters in this one.